Joseph Ramseyer started making wine in Washington in the 1960s. These were the early days of the rebirth of the state’s wine industry when Associated Vintners (now Columbia Winery) and Ste. Michelle Vintners (now Chateau Ste. Michelle) were both getting started. While these wineries would blossom and help form the large industry that exists today, Ramseyer would focus his efforts as a home winemaker. For Ramseyer, who would become one of the founding members of the Enological Society of the Pacific Northwest (now the Seattle Wine Society), making wine was a family affair. The whole family worked to pick the grapes, crush, and press them. The grapes for the wines came from the Grandview area not far from what would one day become Boushey Vineyards. Throughout the years, the Ramseyer family rarely missed a vintage until Joseph passed away in 1986. The experience of making wine with his father left a lasting impression on Ramseyer’s son, John. Since he was young, John Ramseyer always dreamed of one day working his own vineyard and making his own wine. In 2005, Ramseyer and his wife Heather decided to turn that dream into reality. Ramseyer started by purchasing fruit from Dineen Vineyard, making two barrels of Cabernet Sauvignon in 2005. Additionally, he purchased seventy-acres of land in Zillah on the site of a former apple orchard. The site is located near Dineen, Two Blondes, and Sheridan vineyards. Ramseyer planted five acres at the Zillah site in 2007, including three acres of Cabernet Sauvignon, one acre of Cabernet Franc, and a half-acre each of Merlot and Malbec. The first fruit from this vineyard was picked last fall. 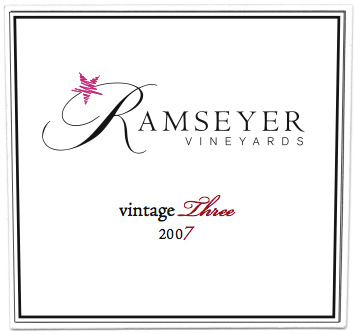 Earlier this year, Ramseyer Vineyards had its third release – Vintage Three. Each year John Ramseyer makes only one wine and makes it in limited quantity from the winery’s best barrels. Ramseyer says, “I’ve always wanted to focus on one wine, ” saying he enjoys putting all of his efforts into a single product much like a parent does into a child. Ramseyer Vineyards doesn’t have a tasting room, and John Ramseyer says that it most likely never will. Rather there is just a modest barrel room at the vineyard site. Currently the wines are crushed, fermented, and pressed at the Sheridan Vineyard facility. The winery is microscopic, producing three hundred cases annually. Ramseyer says he has no plans to grow the winery dramatically, preferring to keep it small. The wines are sold through a mailing list and to a limited number of restaurants. Five years after starting Ramseyer Vineyards, John Ramseyer’s own children now help in the vineyard and at the winery. In May Ramseyer had a party in Zillah to celebrate the release of his third vintage. Many of his father’s friends came. “Dad would have been thrilled,” he says. Rating: * (Excellent) Nose shows a lot of blackberry, earth, and syrupy anise aromas. Palate has opulent amounts of blackberry fruit. This is a big, bold, fruit laden wine with silky tannins and a long finish. 67% Cabernet Sauvignon, 25% Merlot, 8% Cabernet Franc. Dineen and Sheridan vineyards. Aged in French oak. 14.4% alcohol. 300 cases produced. I just signed up for the mailing list. The nerve of someone making an Excellent wine in the Yak that I've not tried yet :). Sounds like a neat project Sean, thanks for the report. 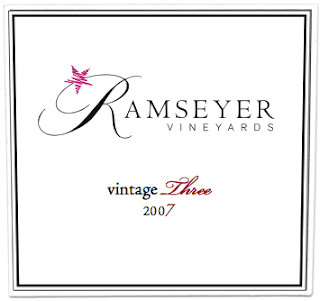 I first found out about Ramseyer Vineyards almost exactly one year ago (mid July, 2009) I went over to Zillah with a group from Woodinville's Village Wine, where we bottled our club wine at Sheridan Vineyards. Before our bottling began, we toured the vineyards of DuBrul, then went to Ramseyer for a friendly and relaxing tasting. I'll never forget how sweet they were, putting up with all of us descending on them, providing a bunch of cold water and wonderful wine for us on a super hot day. We sipped wine while we sat on the porch and looked out at the incredible view. Super nice family. Very nice wine. I first had the opportunity to taste Ramseyer’s wine (Vintage 2, 2006) at a wine tasting here in Southern California with the rest of my “California Wine Snob” friends. One of our friends snuck it into “$60 to $100 a bottle” wine tasting, and it “blew us away”. We immediately “ponied up” the cash to acquire more of the ’06 (through our friend who happened to be on the mailing list) only to find the ’06 had sold out. Undaunted, we made sure our buddy went “all in” for as much ’07 (Vintage 3) as we could get our hands on and we each snagged a few bottles (limited supply, big demand). Hoping it was going to be “on par” with the ’06, the ’07 turned out to be EVEN BETTER! Now we’re “hooked. Our strategy was simple; don’t tell a sole and buy as much as possible every year. Then I read this article and with one stoke of the “send key” our plan has been foiled! And the whole “Dad ignited the passion, the Son carries on the tradition and they are such a nice family, blah, blah, blah”…we’re screwed! Anon, sorry to spoil your secret!